This is my Valentine to my little space cadet. When I was in second grade my teacher asked our class to draw pictures of what we wanted to be when we grew up. I drew a line down the middle of the page and one side drew an artist, on the other side I drew an astronaut. Pastry chef came close enough, right? I did briefly try to pursue that space dream, but a few months into flight school I quickly learned that my love of the sky was more as a wide-eyed stargazer and less as a physics loving math geek. You’ll understand now, why when my little guy told me that he wanted to take a rocket ship to outer space and look at the stars, my heart skipped a beat. He’s only 3 (going on 4), so I think we have a little while to start checking out aeronautical engineering schools. 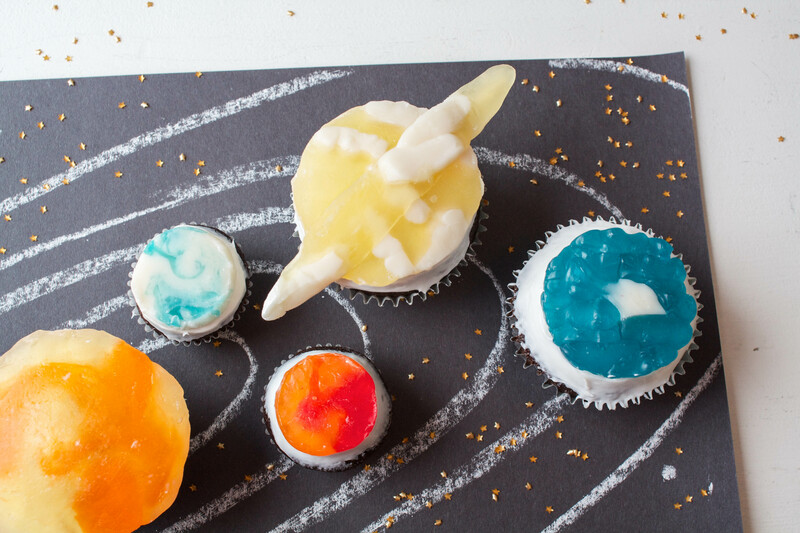 In the meantime, we can still have a little fun looking at “pwanets”, finding constellations, and gobbling up some planet cupcakes. 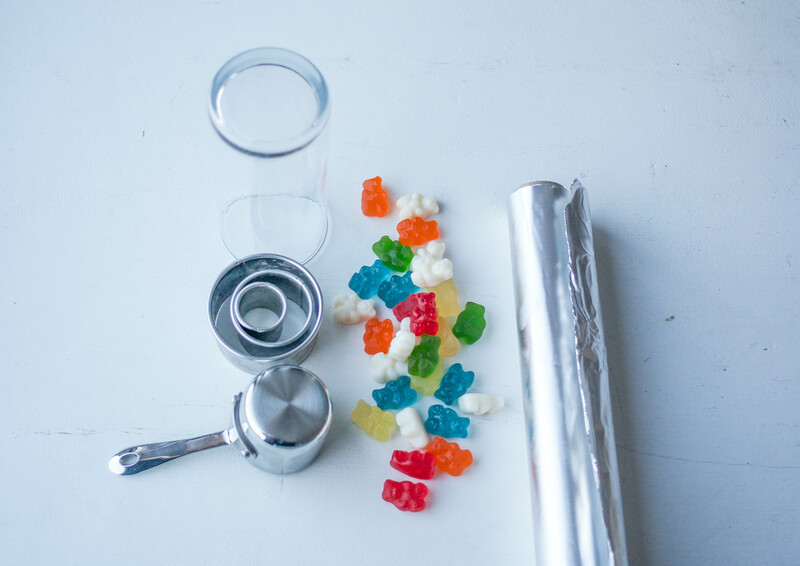 Gummy bears in red, orange, yellow, green, blue, and white (If you can find purple, awesome! I couldn’t. 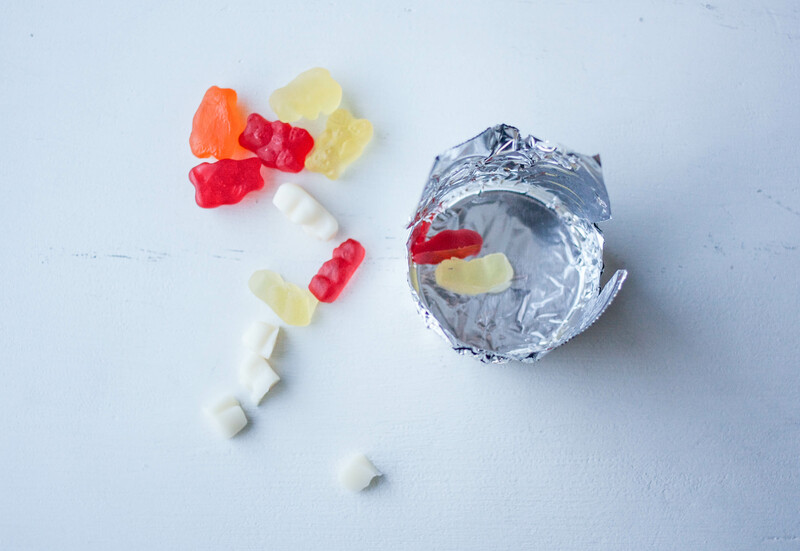 If you can’t find white, try the bellies of gummy sharks or frogs. Circle cookie cutters, drinking glasses, anything with a solid round base. Position a rack in the center of your oven and heat the oven to 275 degrees. 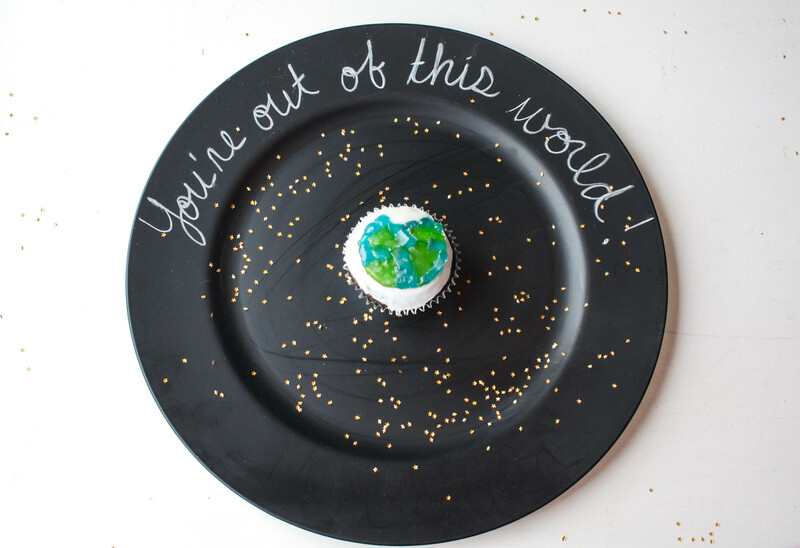 Tear off a piece of foil about 1-inch larger all around than the round item that you’re going to use to make your planet mold. Here I used the bottom of a drinking glass. Press the foil over the bottom of the glass, making sure the sides are very tight and smooth. Repeat, making enough for all of your planets and a sun. 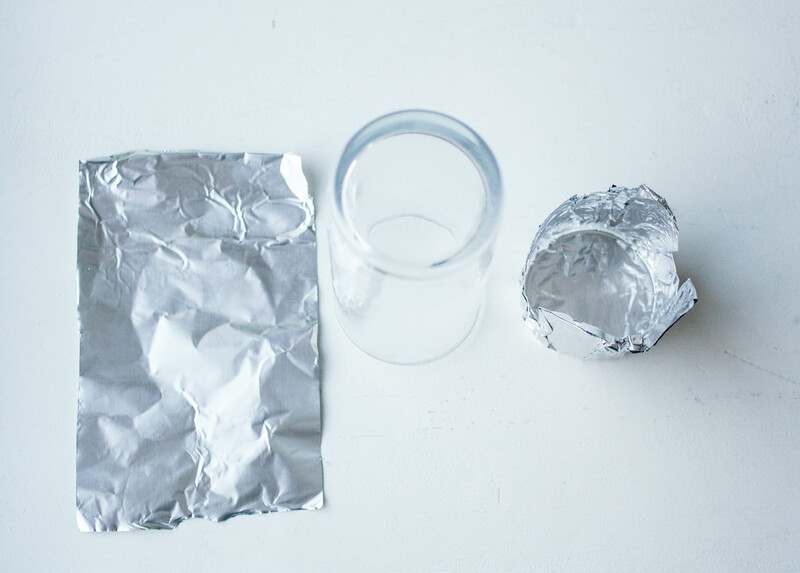 Make a little flat-bottomed foil boat to create Saturn’s rings. Spray all of your cups with cooking spray. I mixed up the sizes of the planets to try and make them as accurate as possible. I wouldn’t report you to NASA if you did all one size. 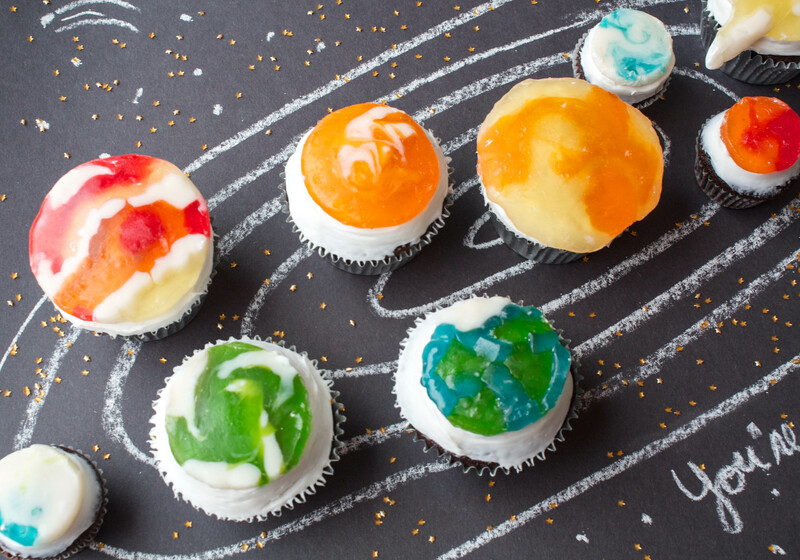 Cut up your gummy bears and arrange them into the cups to create each planet’s distinct color patterns. I tried to keep the colors as close to the reality as possible, but keep in mind we are dealing with gummy bears here. 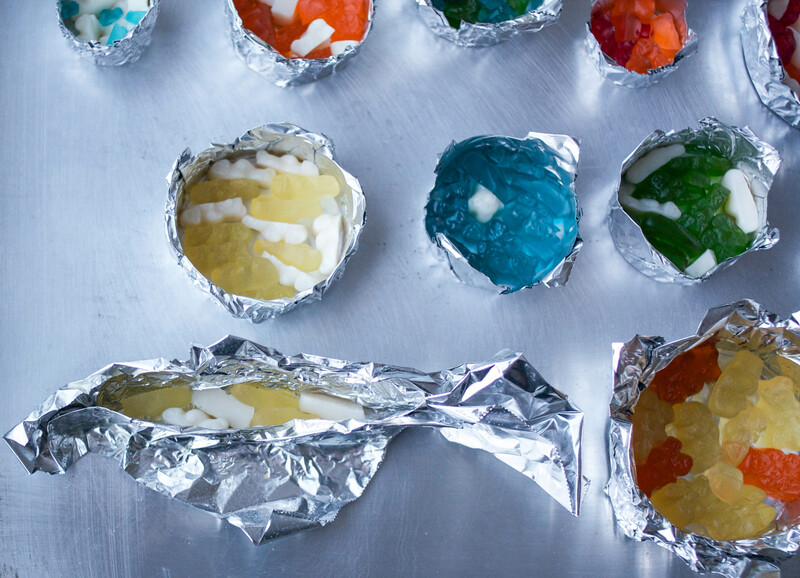 Place the filled cups onto a cookie sheet and bake for 5 to 8 minutes. I suggest checking at 5 minutes and pulling any of the planets that look done to you. Orange and yellow melted much quicker for me than green and blue. 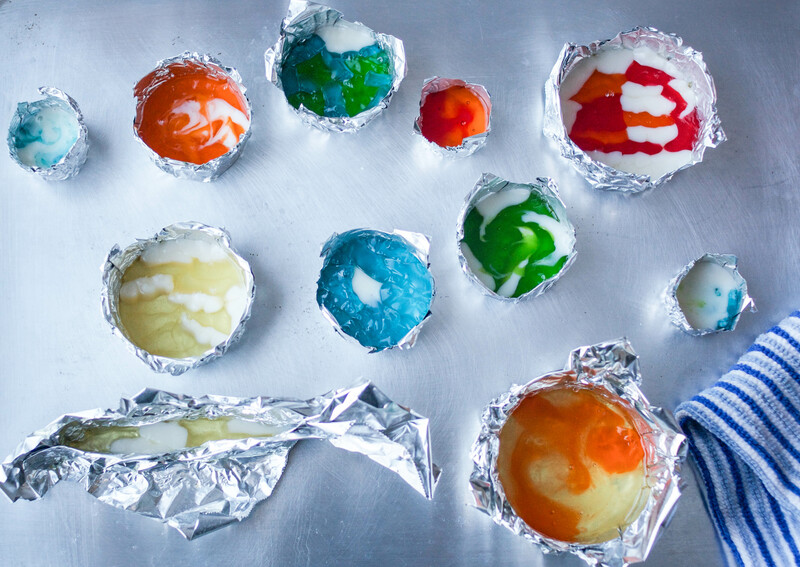 Use a tooth pick or skewer to swirl the colors on the more gaseous planets while the candy is still hot. 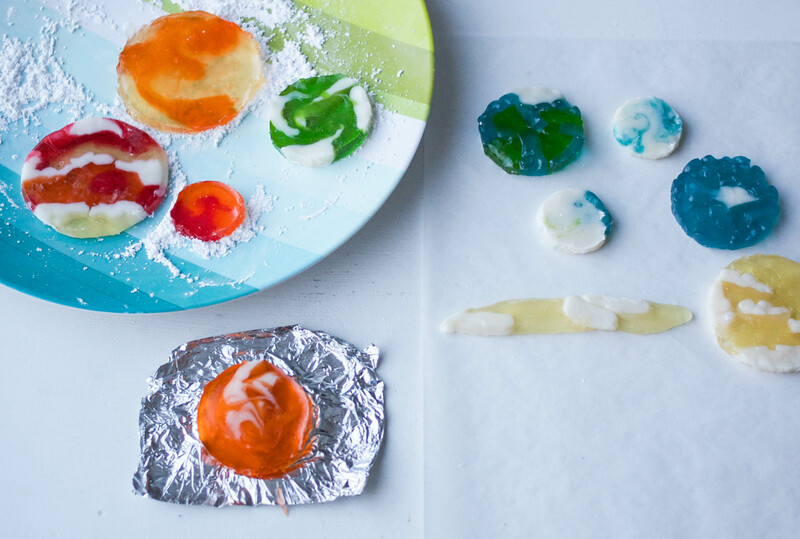 Allow the planets to cool on the cookie sheet for about 5 minutes. Then move them to a plate and refrigerate until they are completely solid. 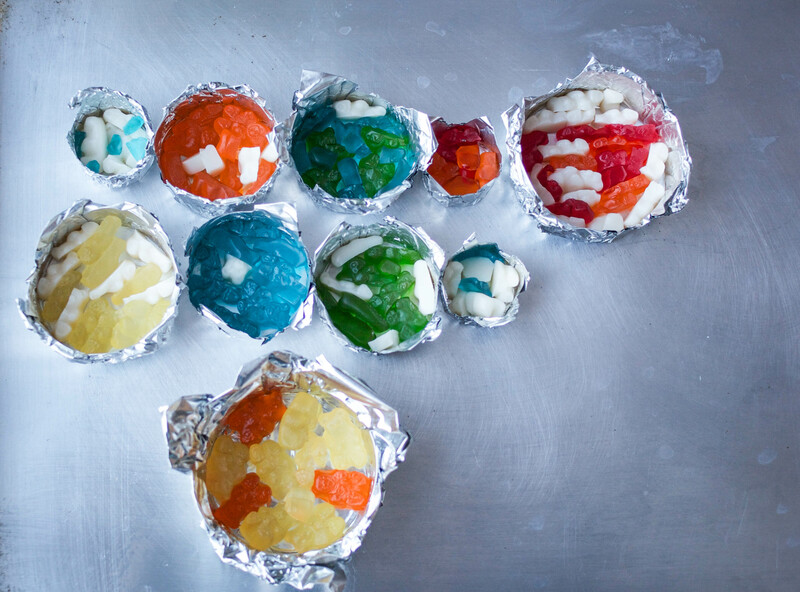 Refrigerating will make removing your planets from the foil much easier. Fold back the foil around the sides of your planet first. Then peel the foil off of the bottom. 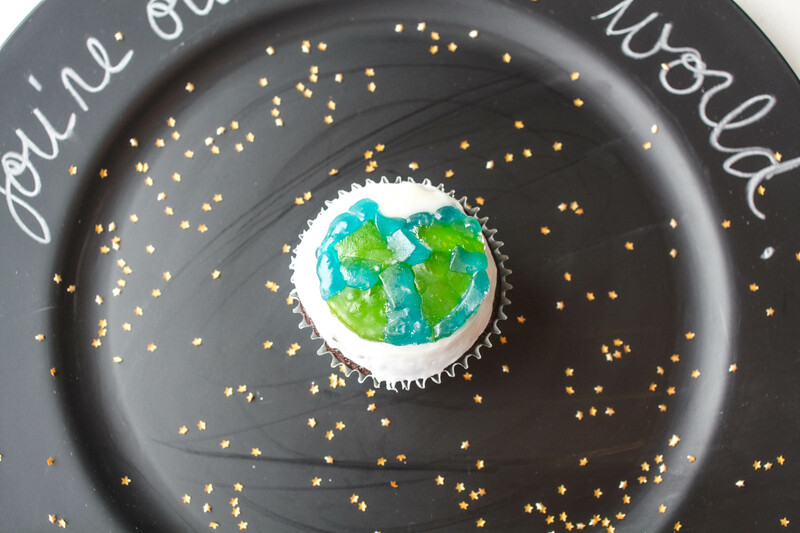 Place your planet on a plate that’s been dusted with powdered sugar before moving it to a piece of parchment paper or wax paper. The powdered sugar helps reduce sticking and makes the planets easier to handle. Enjoy your planets right away, or store for up to three months in an airtight container. Layer them with parchment paper and a little bit of powdered sugar to prevent sticking. 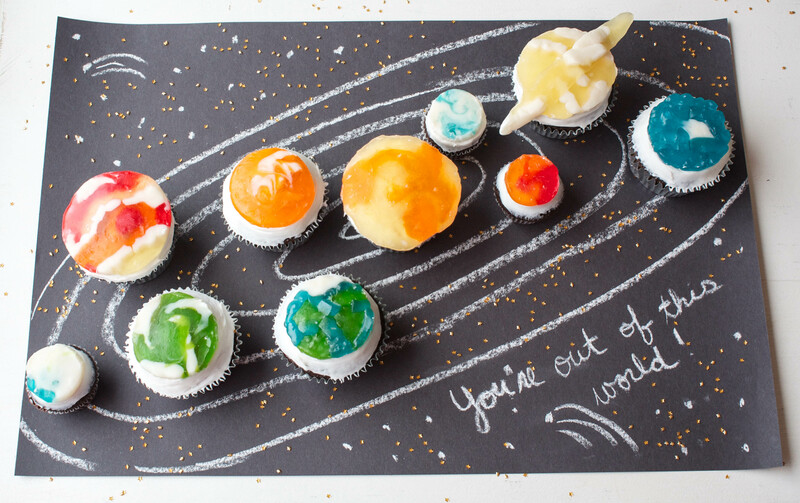 I served up my planets as cupcake toppers orbiting the sun on a piece of black construction paper with white orbit lines and a message drawn with chalk. The finishing touch was a dusting of tiny gold star sprinkles . My little space cadet got his cupcake served up to him on a chalkboard charger finished the same way. He loved these and can’t stop talking about them. Which is good, because I can guarantee they will return for a birthday (or two, or mine) and a science project at some point as well.